Books are the gateway to imagination and adventure. This month's theme introduces the boys to the world of books and the fun they can have reading them. The boys could visit the library with their den and explore the "card catalog computer," then go down the aisles in search of adventure. The library may have age-appropriate programs for the boys; the librarians could introduce them to books that can transport them to new and exciting worlds. Encourage the boys to sign up for their own library cards and check out some books. At the pack meeting the boys can perform some of their favorite adventures in a skit or a puppet play. Take part in Pedro's “Say Yes to Reading” program in Boy's Life. This might also be a good month to work on the Communicating or Computer belt loop and pin. ü Family Understanding, Families can work together with their boys to complete the "Say Yes to Reading" Program sponsored by Boys' Life. (Get the details in Special Opportunities section) Reading together builds family closeness. ü Fun and Adventure, Cub Scouts will have fun exploring the world of books. 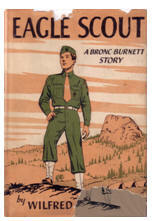 ü Preparation for Boy Scouts, Reading is a FUNdamental part f earning Merit Badges. This month's theme can help boys learn to enjoy reading. ü Courage, Through reading different books, boys will understand that having courage means making the right choice rather than the absence of fear. Seems each Pow Wow CD I had took a different approach to this theme. Most chose one type of book and out material for that theme (e.g. folklore). I hope I have enough general material for you here. Carefully read National's material (CS Program Helps and CS RT Guide) and listen to Cubcast so you will you turn the right pages this month. Don’t miss the great article on getting your Cubs to read in the September 2008 issue of Scouting Magazine, "Guys Read Guy Books." The author really understands us reluctant readers. Whatever happened to the book series for boys?? The Hardy Boys? Duane Decker's books about the Blue Sox Baseball Team? And my favorite - Bronc Burnett - Bronc was the hero of 27 books written by Wilfred McCormick from 1948 to 1967. He lived in fictional Sonora, New Mexico. In 14 books he was a star baseball player, in 12, a star football player. And in one - AN EAGLE SCOUT! Had a great time in Philmont with the members of the CS Program Helps Task Force and the CS RT Planning Guide Task Force and the National Program Enrichment Chair (whom I have known since 1999 and who was awarded the Silver Buffalo this year) and the National Themes Chair. Talk about a wild and crazy bunch of Scouters. The 2010-2011 books will be really great!!!! And I met many long time friends, like Rachel from Rice who always ends me the SHAC Pow Wow CD and Sakiko, who has been on the Cubcast (Podcast) and my friend for many years. Kathy, a good friend of Scouter Jim's in Bountiful took my picture so she could show him. And many more. And my wife had a great time. It was her first time in classes and she was impressed. So don’t hesitate, signup for next year's Cub Scout Extravaganza and start earning your Philmont Training Center Square Knot!!! National makes a patch for every Cub Scout Monthly theme. This is the one for this theme And September's that came out too late for the previous issue of Baloo. Check them out at www.scoutstuff.org go to Uniforms & Insignia, then Standard Emblems and look for 2008 Cub Scout Monthly Theme Emblems.